Pomegranates: a pain in the you know what to open but worth every minute once you get to the jewels. Sweet, juicy, fantastic. I get slightly giddy every time I see them in the market this time of year. Besides being delicious, they are just so beautiful. 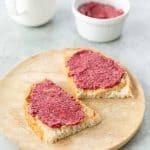 I was first introduced to the fruit back in middle school, when weekends meant sleepovers at my friend Kayva’s house, full of late-night gossiping, Bollywood movies, and pomegranates. I had never seen a pomegranate before but was hooked the moment I tasted the seeds. Never mind that I would come home covered in pomegranate juice, lips and fingers stained as well. While I haven’t seen Kavya in over 15 years, I still think of our sleepovers whenever I buy a pomegranate. This quinoa is the perfect blend of juicy, sweet & salty. I like to called it Christmas Quinoa, a beautiful blend of red, green, and white. Like most of my grain salad combos, this one stays fresh in the fridge for days. Great for packed lunches or a side dish for the Holidays. Need a refresher on how to prep a pomegranate? See my step-by-step photo guide here. Pomegranate Quinoa Salad! A beautiful side dish loaded with nutrient rich pomegranate seeds, quinoa, and celery. Let cool completely. I like to cook my quinoa on the stove, keep covered and remove from heat. Let sit for an hour until completely cooled, fork to fluff the quinoa kernels. In a large bowl, combine cucumber, pepper, pomegranate arils, feta (if using), toasted nuts, and mint. Whisk together the minced garlic clove, lemon, olive oil and pinch salt/pepper. I love this at room temperature but feel free to pop in the fridge for an hour or two. I was eyeballing pomegranate seeds at the grocery store yesterday and trying to think of something to make with them. 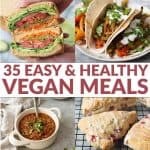 This salad sounds perfect! Love this combo! 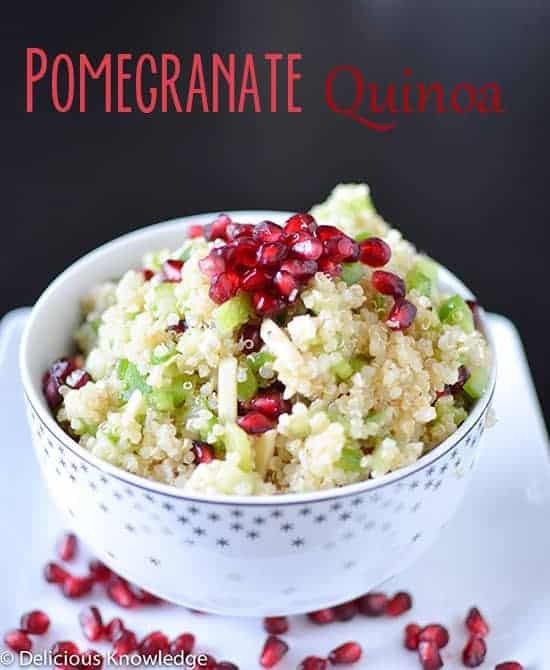 I’m always game for pomegranate and mixing them with quinoa makes superfood heaven! The brightness of the pomegranate really caught my eye here. I love the colours. This type of red always reminds me of the holidays. I really enjoy pomegranates. Not only is it high in anthocyanins and antioxidants, it’s a great fruit that adds some texture. I’ve tried putting it in a regular green salad before, but I would have never thought to have put it with quinoa. I definitely need to give this one a try. Thank you for sharing!